If there is a particular drum that I like to bang with my retained clients it is that, in order to grow, you need to spend more time looking forward than you do looking back. I wrote an article about lagging and leading key performance indicators (KPI's) recently and that is certainly part of what I am talking about. I am also talking about the relative importance of forecasting rather than budgeting. When I start working with clients, they often tell me "I need a budget". My response is usually, "maybe, but you need a working business model and a forecast you are willing to implement a lot more". Some of my more skeptical clients suggest to me that I have this wrong and that anyone can make a profit on their forecasts. I believe this reflects a lack of faith in themselves and perhaps a lack of understanding about proper forecasting. 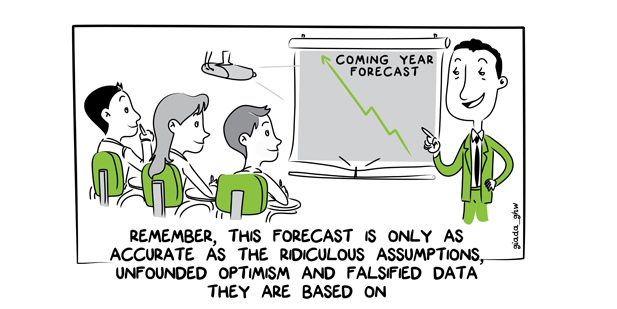 Done properly, forecasting is a much better roadmap to profitability than a budget. My issue with budgeting, especially in todays fast moving business environment, is that it can make you look the wrong way. In business, your eyes should be fixed on the horizon and on what is coming rather than on our feet or navel in an attempt to figure out what has happened or is happening. Greg Crabtree in his great book "Simple Numbers, Straight Talk, Big Profits" recommends that growth hungry entrepreneurs spend about 25% of their effort looking at what has happened and about 75% of their effort looking at what they want to make happen. I wholeheartedly endorse this idea. Here is what I do in my businesses and what I encourage my clients to do. I draw up a plan at the beginning of each year that says what I expect that year. It includes sales, cost and pre-tax profit forecasts, plus the details of what I plan to do with the surplus cash in the business and when I plan to do it. The question then becomes, what have I actually done and what do I think I will do for the rest of the year? I record my actual numbers at the end of each week and if any forecast numbers till the end of the year need tweaking in the light of new information or in the light of an emerging market trend, I amend those as well. I amend my forecasts probably once a month. That gives me a clear picture throughout the year of where I expect to be by the end of the financial year and if the plans I made with regards the distributable profits of the company are plausible or not. This might sound like a lot of work, but it is actually easier to keep up with than you might imagine. You don't need to review every detail on your profit and loss staements each week. It just needs to be kept simple. Key questions are "What'smy revenue? ", "What's my cost of goods sold? ", " What are my labour costs?" and "What are my operating expenses?". These numbers do not jump around as much as you might think and ought to be monitored closely. You do not need a complicated, expensive and detail orientated cash flow projection system. My observation about doing this work in small businesses is that if you spend all your time updating the system, you will not spend any time analysing the data. This shouldn't take you any more than one hour total per month. If it does, the system that you are using is too complex and needs to be simplified. Where do we stand on profitability? How close are we to our sales targets? What are our operating expenses? Do we understand the tax implications of our profits? When we work with forecasts, we are looking toward the future and anticipating problems in time to respond appropriately to them or seeing opportunities in time to seize them. When we are focused on budgets and past performance against budget exclusively, we can fall into the trap of running our businesses reactively and of always looking backwards over our shoulders. To unlock the power of forecasting within your small business, speak to us today and see where creating your own roadmap to profitability might take you and your business.